Biscuits are great to go with just about any type of meal at any time. 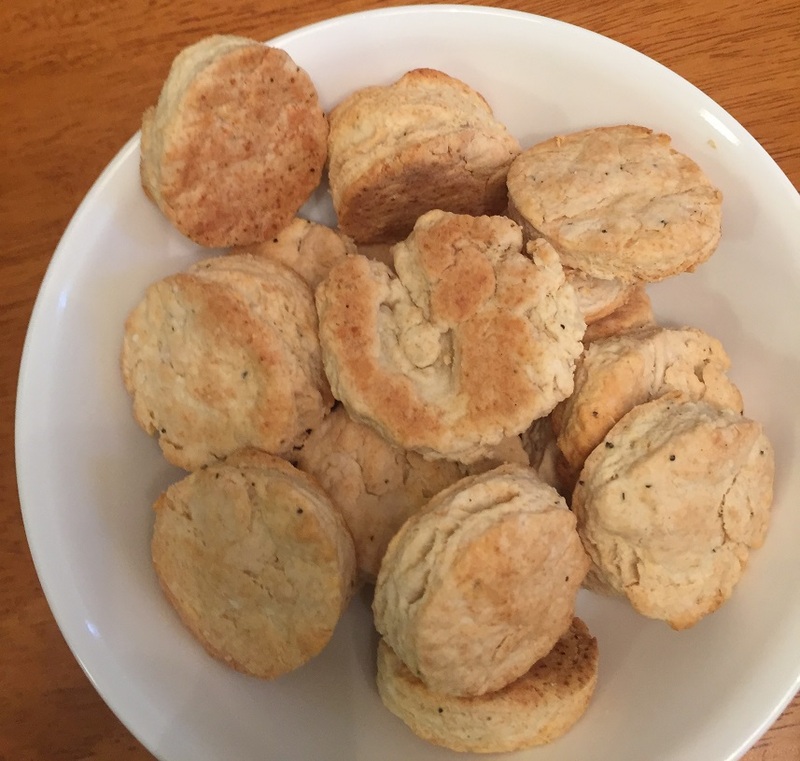 I like to make a big batch of biscuits so that we have them around to have with various dinners or to go with breakfast with an egg and some bacon or just warmed with some butter for a nice snack now and then. The great thing about biscuits is that there seems to be an endless number of biscuit recipes and most of them are really easy to make any time you might like one. It is usually just a matter of having a few ingredients on hand to get started and you can have them for any meal you like. I liked this recipe from Bon Appetit for salt and pepper biscuits for a little bit of a different flavor. Preheat the oven to 425 degrees. Whisk the sour cream and 3 tablespoons of the heavy cream in a small bowl. Pulse the baking powder, kosher salt, sugar, 1/2 teaspoon of pepper and 2 cups of flour together in the food processor until they are combined. Add the butter and pulse the mixture until it is the texture of coarse meal with a few pea-sized pieces of butter remaining. Transfer the mixture to a large bowl. Using a spoon, mix in the sour cream mixture, then gently knead the mixture a few times just until a shaggy dough comes together. Use a light hand with this part so you get tender biscuits; be careful not to overmix the dough. Roll out the dough on a lightly floured work surface until the dough is about 3/4-inch thick. Using a biscuit cutter, cut out the biscuits, re-rolling the scraps as needed so you can use all of the dough. Place the biscuits on a parchment paper-lined baking sheet and brush the tops of the biscuits with the remaining 1 tablespoon of heavy cream. Sprinkle the biscuits with the sea salt and more black pepper. Bake until the biscuits are golden brown on the tops and the bottoms, about 15 to 20 minutes. Serve the biscuits warm with butter, if desired. You could make this dough about 6 hours ahead of time if you want and just chill it until you are ready to use it. You get a really nice tangy flavor from the sour cream in the biscuits and I liked the mix of the salt and pepper with each one. I cut smaller biscuits than the typical 2 inches of biscuits so I got more from my batch. The recipe indicates you can get 8 2 1/4-inch biscuits if you use the larger cutter. they were perfect to go with our meal and are great to have with soups, stew, chili or just to have on the side of any beef or poultry meal that you have. As I said, they are also great for breakfast with some egg, bacon or sausage or just by themselves with a cup of coffee or tea. You do want to be careful with the kneading and overmixing so you do not get tough biscuits, which has happened to me before. A light touch seems to work best here.